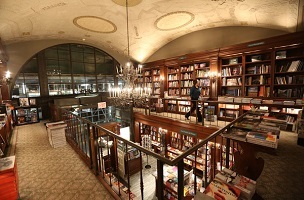 Julie Bosman’s disheartening NYT look at the dwindling number of Manhattan bookstores is a Dickens of a downer. In this tale of two cities, the best-times scenario has been gradually giving way to a bookworm’s worst nightmare. Perhaps salvation will come in the form of a one-time Fifth Avenue sweet shingle. Bosman writes that within the book industry, there are “whispers” that publishing houses may open stores in the manner that Doubleday and Scribner once operated. Read her full piece here.